The 1988 model has remarkably refined style over the 1987 model, as represented by the smaller double bullet tail lights. However, more importantly is the significant improvements that have been made inside the engine. Carburetor sees a 4mm increase in bore to a 32mm bore, the operation of the carburetor is incorporated within the PGM unit which controls the solenoid valve in order to provide a precise response. The PGM also provides rapid engine management using a three dimensional map based on throttle position, engine RPM and ignition timing. In additional to visual improvements is the electronically controlled supply of engine oil. Also included are improvements to the RC Valves which have evolved for more accuracy, coated pistons to withstand higher output, dedicated oil pump and better position of the engine in the frame. As a result, performamnce is greatly increased at all ranges of engine speed. It also increases the control of RPM in all directions. Changes are also seen with the chassis which include a more forward and lower mounted engine, main diagonal 5 section tubular frame and hollow cast pivot section provided a highly rigid frame with extreme balance. Front forks have been increased to 41mm diameter. Front and rear radial tires are wider then the previous year. The SP Version was made available in 1988. The name came from the SP (Sport Production) race series. 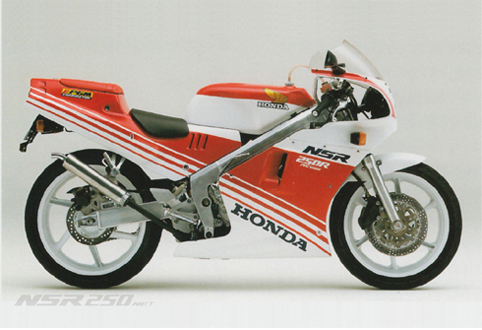 At this time, the SP race class was limited to motorcycles that were based on commercially available motorcycles that were limited in scope of modifications, which had attracted large amounts of attention in Japan. The series had large number of participant which kept the audiences attention. Achieving good results in the SP series, was directly linked to the sales on the sales room floor. 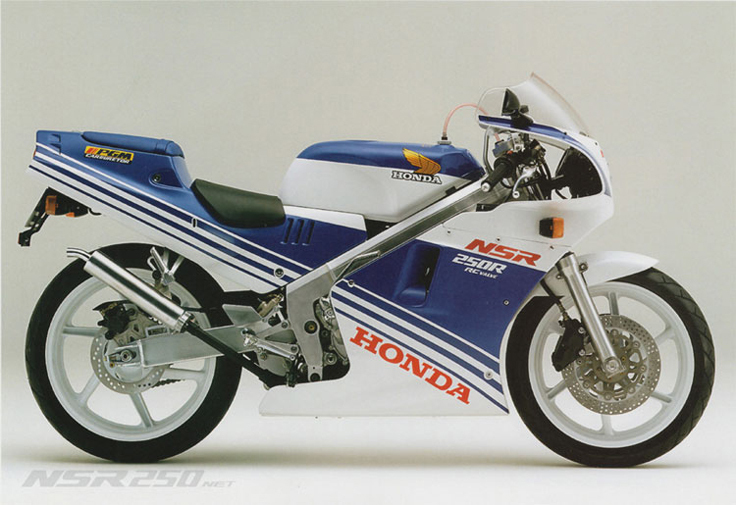 The NSR competed against the TZR in the Tsubuka SP series and took the championship that first year. This was the start to a long road of glory. The SP version replaces the front and rear aluminum wheels on the STD (Standard) edition with the world's first commercially available magnesium rims found on a mass production motorcycle. Magnesium wheels which has been mass produced for the automotive market where very lightweight with a hard surface to reduce oxidation, were developed for practical use by a joint venture with Nippon Light Metal Co., LTD. In order to employee the lightweight benefits of the material effectively, a new die-casting process was employed which provided a high corrosion resistant magnesium alloy with extremely high density for strength. Further more, high quality was also achieved by applying a surface treatment with excellent coating paint. When compared to the aluminum wheels of the STD model, the front and back magnesium wheels reduced the weight by 1.5kg each. The reduction in weight in the wheels, provides significant benefits in riding performance. By reducing the un-sprung weight with the rims, the inclusion of performance road tires also improved the sport performance as well as the ride quality. Also because of the rotation of the larger diameter rear wheel, maneuverability is increased by increased gyroscopic effects, acceleration and deceleration was also improved due to the reduction in rotational weight. And finally, larger wheels front and rear, provided a more centralized concentration of body mass. 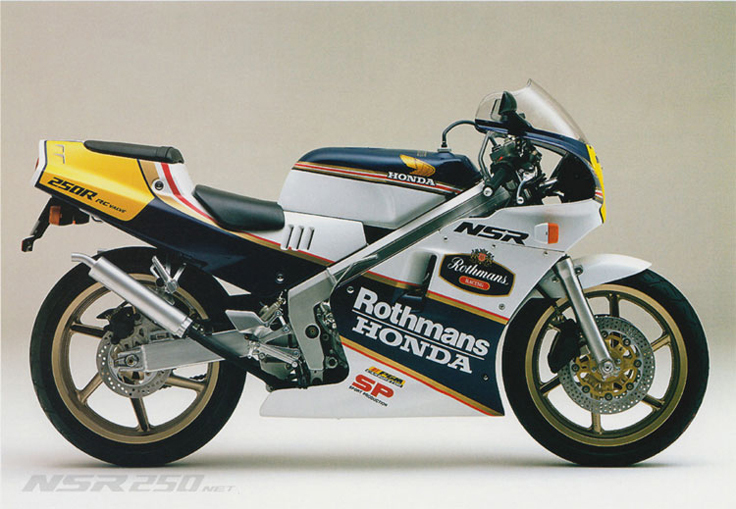 The styling which also included the looks of the Rothmans Honda Racing team, which had been active in the world racing series and riders of the day, was available only on the SP model. Other improvements which were also included in the STD model included the a new exhaust chamber design with slimmer tailpipes, intelligently designed engine which provided additional rigidity and provided greater braking performance all achieved significant improvements over the previous year.